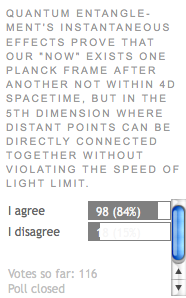 Poll 52 - "Quantum entanglement's instantaneous effects prove that our "now" exists one planck frame after another not within 4D spacetime, but in the 5th dimension where distant points can be directly connected together without violating the speed of light limit." Poll ended November 15 2009. 84.5% agreed while 15.5% did not. 49 - Are We an Expanding Sphere on a 4D Hypersphere? 51 - Do Animals Have Souls? Even though these each looked at quite different ideas, they all keep coming back to the same central theme of the fifth dimension, and how the "now" that we're in from instant to instant is part of a fifth dimensional probability space that we are experiencing one planck frame at a time. 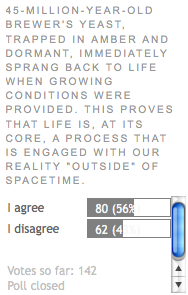 With this poll question, we are again talking about the fifth dimension, but this time only as it relates to our quantum world. I've talked a number of times about how quantum mechanics tends to be portrayed to the public as being unimaginably strange, formidably incomprehensible. Don't the parallel universes that arise from Everett's Many Worlds interpretation of quantum mechanics seem to defy logic? How can we imagine that our fourth-dimensional spacetime could hold such mind-boggling variations resulting from chance and choice? And doesn't quantum entanglement violate Einstein's rules about "no faster than light travel in our universe"? The answer to all of the above, I would say, is simple: relativity and logic are not being violated if we imagine that our reality is in five dimensions, where the additional degree of freedom offered by that dimension allows all of those "spooky" connections to easily take place (for more about all this you might enjoy The Fifth Dimension is Spooky. String Theory (or M Theory) is the theory of reality that is still, despite the protests of a noisy minority, the dominant paradigm today. 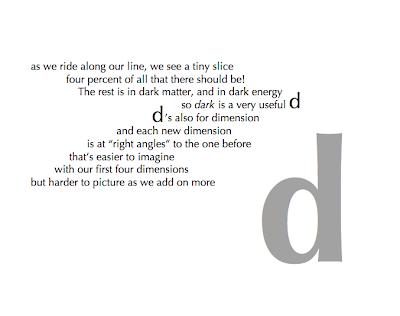 In my new book O is for Omniverse, my goal was to boil the ideas from Imagining the Tenth Dimension down into a package that is easy as possible for everyone to consume: with that in mind, in O is for Omniverse I don't talk about any dimensions beyond the fifth. Now, I'm not for a moment suggesting that I understand all of the above topics, but it's good to know that there are brilliant people like these out there that are thinking deeply about the underlying structures of our reality, and in a number of cases relating that to discussions of extra dimensions. There's more to our reality than what we see around us, and it's waiting there for our discovery!
. August 09 . September 09 . October 09 . As you'll see, something very unusual happened this month - a brand new entry that is number one for the month has also vaulted to the number one position in the list of all-time-most-viewed blogs! And as of November 26th, 2009, here are the twenty-six Imagining the Tenth Dimension blog entries that have attracted the most visits of all time. Items marked in bold are new or have risen since last month. Polls Archive 51 - Do Animals Have Souls? Poll 51: "Do animals have souls? Choose (1) for 'yes', (2) for 'no, only humans have souls', or (3) for 'there's no such thing as a soul'. Poll ended November 1 2009. 59.1% picked choice number 1, 8.7% went for choice number 2, and the remaining 32.2% said "there's no such thing as a soul". We continued on to related ideas in the next few blogs that followed: Computers and Consciousness, Connecting It All Together, Suffering in the Multiverse, and The Biocentric Universe Part 2, all looked at the relationship between consciousness and the quantum wave function, free will and how our universe is created, and the role "life" (or "soul" if you're willing to apply that term) plays in those processes. Beer and Miracles, one of my personal favorite blogs from the last few months, wrapped this all up with a discussion of how unlikely events, Everett's Many Worlds, and life all are part of the same dance that creates the universe each of us are witnessing right now. To the extent that it matters, I believe that to be just as true whether you're an ancient yeast cell, a fruit fly, a human being, or a seventeen-year-old mostly-Bichon named Buddy. PS - On the subject of the unique universe each of us is witness to, here's a thought-provoking blog from Sentient Developments that offers the suggestion that as each event that could have ended life on our planet passes us by without incident, we may start to notice things around us becoming increasingly strange! You might also enjoy Unlikely Events and Timelessness and Randomness and Missing 96% for further discussion of the weird world in which we live. "45-million-year-old brewer's yeast, trapped in amber and dormant, immediately sprang back to life when growing conditions were provided. This proves that life is, at its core, a process that is engaged with our reality 'outside' of spacetime." Poll ended October 18, 2009. 56.3% agreed, while 43.7% did not. This poll question went up around the same time that my blog entry "Beer and Miracles" was posted, which told the amazing story of these ancient yeast cells. I don't have much to add to this idea here, except to say that it's interesting to me how sometimes my arguments seem to have swayed a lot of people (as I believe we just saw in the previous poll), while in this case close to half of the visitors to this blog still have trouble buying the idea that life might be a process that is very similar in nature to the strange connections of the quantum world. In both cases, I've been proposing that these processes make more sense when we see that they come from the hidden folds made possible by the fifth dimension, which provides an additional degree of freedom beyond the limits of our 4D space-time. 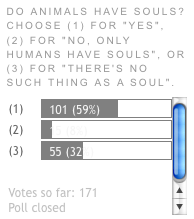 Next: Poll 51 - Do Animals Have Souls? 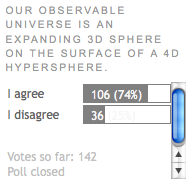 Polls Archive 49 - are we a 3D sphere on a 4D hypersphere? "Our observable universe is an expanding 3D sphere on the surface of a 4D hypersphere." Poll ended Oct. 3 2009. 74.6% agreed, while 25.4% disagreed. I'm pleased to see how many visitors to my blog were willing to agree with this idea: I suspect a sampling of the general public would show a much lower acceptance of this mind-boggling concept. Imagining a 2D circle being mapped onto a 3D sphere is easy enough for us to do, but our brains tend to hit a conceptual roadblock when we take that up a dimension and try to imagine a 3D sphere being mapped onto a 4D hypersphere! We've talked about the Poincaré Conjecture a few times now, in entries like When's a Knot Not a Knot?, Why Do We Need More Than 3 Dimensions?, and An Expanding 4D Sphere. In Aren't There Really 11 Dimensions, I suggested that the slight curvature of our 4D hypersphere is what creates the cosmological horizon, and I've talked many times now about how that relates to the fifth dimension. In my blog entry about Nassim Haramein, we looked at how fractals give us a way to visualize how an infinite number of recursions could be contained within a finite space. This time we're tying those two ideas together. Extra-dimensional spheres are important to all this because they show how our universe could effectively be infinite, but in reality be finite but unbounded. In other words, with each of the dimensions we've been talking about, there are always certain restrictions to that dimension, and you need to move up to the next dimension to move beyond those restrictions. This idea was discussed most recently in What's South of the South Pole?. Here's the video for that entry. Let me give you and example of what "finite but unbounded" means. If I were to start moving on the surface of the earth, I could keep moving forever, but every now and then I would end up back where I started again. If I had some kind of magic telescope that followed the curvature of the earth, then with sufficient magnification I should be able to look through that telescope and see the back of my head! Those examples are from topology, where we are effectively thinking about a 2D surface on a 3D sphere. While we're on that 2D surface it appears that we can keep moving in any particular direction forever, but it's the slight curvature of that surface through the next dimension up that prevents us from being able to see that eventually we're going to end up back where we started. Moving those concepts up to each additional spatial dimension gets harder and harder to visualize, but the Poincaré Conjecture (which should now more correctly be referred to as the Poincaré Theorem since it was proved in 2006 by Grigori Perelman) shows that this logic works for 3D manifolds on 4D hyperspheres as well. Does that mean that if there were some super-Hubble telescope I should be able to look out into space and see the back of my head? No, because the further we look out into space, the further back in time we're looking: in other words, that's not space we're looking at but space-time. If we really were able to look out into space without time being a factor, then we would be seeing that star that's a thousand light years away as it's going to look to us a thousand years from now! It's so easy to forget this important fact. Which takes us back to the idea that the cosmological horizon, which prevents us from being able to see any further back into 4D spacetime than the cosmic microwave background, is directly equivalent to the horizon we see when we're in the middle of the ocean. Both are the result of a slight curvature. The ocean is effectively a 2D surface mapped onto a 3D sphere. Our 3D universe at this particular instant is mapped onto a 4D hypersphere which we call spacetime, and cosmologists generally agree that our universe is expanding at an accelerating rate so with each new planck length expression of our 3D universe it is slightly larger than it was one unit of planck time before. With my project, we take that idea one further. Quantum mechanics and Everett's Many Worlds Interpretation tells us there are multiple "world lines" that could have been traveled to get to this moment, and there are multiple "world lines" that branch out from here. Why can't we see those multiple paths from here? Because our 4D hypersphere is moving on a 5D hypersphere, and just as with those other examples, those other possibilities are "just over the horizon" in the fifth dimension. We know those other world lines exist, and we can move towards the available world lines or recognize that there are multiple previous world lines we could have traveled to get to "now", but we can't see them from our current vantage point. Like the land that is just over the horizon as we're in the middle of the ocean, we know these fifth dimensional branches exist even though we can't see them from here, and it's the slight curvature of our 4D spacetime that gives us our small window into a much larger 5D reality. Why, then, do string theorists say that the fifth dimension is tiny? Because from our 3D/4D perspective it is, just as the ocean appears to be a relatively tiny circle that surrounds us when we're out in the middle of it. Spheres within spheres, wheels within wheels. 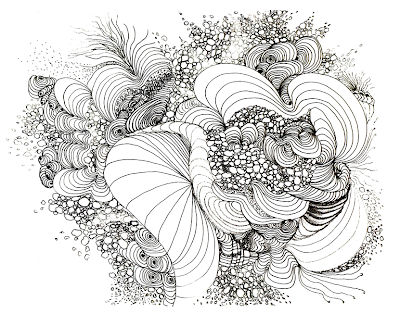 Branching possibilities that allow us to see the way out of loops that we want to change. Enjoy the journey! Ah, the fifth dimension. Almost a year ago, in its inaugural North American issue, Urban Garden Magazine published an article I wrote called Why The Fifth Dimension is a Dangerous Idea, which suggested there might be reasons why the powers-that-be prefer you not to know about the fifth dimension. By the time Kaluza, string theory, and the Holographic Universe principle all tell us our reality comes from the fifth dimension you'd think this would be a mainstream idea by now, but it continues to be ignored. Why? Meanwhile, quantum theories about the many worlds interpretation, non-locality, reverse-time causality, entanglement and tunneling (etc. ), are all portrayed to the general public as being unimaginably strange, something the unwashed masses have no hope of understanding. With this project, I've insisted that the fifth dimension answers those quandaries as well: understanding that our "now" is a point not in the fourth dimension but the fifth, being experienced one planck frame at a time, shows us how all those spooky quantum connections are easily made once you get "outside" of the limits of 4D spacetime and use the "additional degree of freedom" that an additional spatial dimension affords us. The fact that this also gives us a way to understand why from our perspective the fifth spatial dimension is "curled up at the planck length" is, for me, the icing on the cake. Here's some blogs about all that: The Fifth Dimension Isn't Magic, Local Realism Bites the Dust, An Expanding 4D Sphere, and The Fifth Dimension is Spooky. And for entries which then explore the more metaphysical side of these connections, check out The Shaman, Modern Shamans, Computers and Consciousness, David Jay Brown and Psychedelics, Time in 3 Dimensions, I Know You, You Know Me, and You are Me and We are All Together. that wonderful spark is found within you"
My most popular blog entry of all time is now Jumping Jesus, in which we talked about the intimate connection between the observer and the observed, and how the acceleration of consciousness, information, and the universe may be more inter-related than we could possibly imagine. In Beer and Miracles, we talked about how unlikely life is, and what a marvel it is because of that. In Creativity and the Quantum Universe we talked about the mysterious processes that allow life to happen, and in entries like Alien Mathematics, The Statistical Universe, and Randomness and the Missing 96%, we've talked about how unlikely our universe itself is when you back out to the big picture of all possibilities. 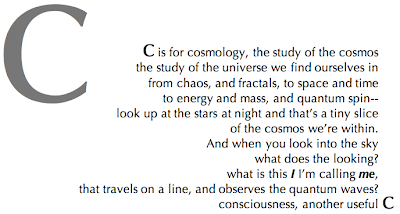 Which, of course, is the point of "O is for Omniverse": it's all about thinking about those big picture ideas. Want to know more about this innovative and mind-expanding book from myself and Marilyn E. Robertson? Go to omniverse.tv . Next - Poll 49 - Are We a 3D Sphere on a 4D Hypersphere? of all living things -- through time in each direction"
Some of my favorite blog entries that link to how this idea ties in include: The Long Undulating Snake, Placebos and Nocebos, Now vs. the Future, The Biocentric Universe, Evolution's Fast Lane, and You Have a Shape and a Trajectory. to make a 4D object, like a spime"
Bruce Sterling coined the word "spime" to refer to the data set representing an object's existence in space and time - Wal-mart, for instance, is famous for being able to keep such detailed information about everything in their inventory across all their stores, so the data representing a pair of pants on a shelf in a specific store would include the record of when and where those pants were created, how and when and through what path they were transported, and so on... and that entire data set would represent that pair of pants as a space-time object - a "spime". 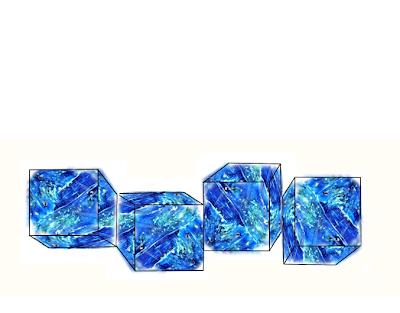 Visualizing the connection between hypercubes (a 4D cube), each of us as a "long undulating snake", and Bruce Sterling's concept of the "spime" is an important key to thinking about our reality. Which leads us to our next letter. equal each other, can this be? and find their balance -- in perfect symmetry"
Information Equals Reality, John Wheeler and Digital Physics, The Big Bang is an Illusion, and The Holographic Universe. is even more surprising: it branches either way!" I talk about Wheeler's delayed choice experiment in detail in The Flexi-Laws of Physics. Understanding that events from the future can affect "now", which means that events "now" can affect the past, takes some getting used to, no question! Other blogs where we've looked at what this "retro-causality" means to our perception of reality include: Alien Mathematics, The Statistical Universe, The Quantum Solution to Time's Arrow, Norway's Reverse Deja Vu, The Long Undulating Snake, The Biocentric Universe Part 2, The Biocentric Universe, The Past is an Illusion, The Flipbook Universe, and Local Realism Bites the Dust. In my book and this blog, I've talked about how there could be other completely different ways of expressing matter and energy that would still rightly be called "life", but perhaps those other formulations exist only within other parts of the multiverse landscape. Perhaps when we do finally find life elsewhere in the universe, the "fine-tuning" of our universe's conditions will have created forms that only seem as alien as the strange assortment of creatures we can find on our own planet. Watching the above BBC documentary about these strange and beautiful creatures found off the coast of south Australia reminded me strongly of what I was talking about in that blog. In fact, we've become so accustomed to seeing photographically realistic alien life forms in movies now, I'm sure there are a good many of us who first looked at the above movie clip and assumed we were looking at computer-generated imagery! In my book "O is for Omniverse", W is for water. Why? Because no matter where you go, that's the one thing all life on our planet shares in common. No water, no life. There have been scientific studies suggesting other building blocks could possibly have been used to create life on other planets, but that remains to be seen. Wouldn't it be interesting if it turns out that our universe's uniquely fine-tuned basic physical laws resulted in water being the one thing that all life in the universe shares? My song Change and Renewal starts and ends with a prayer to the healing and rejuvenating powers of water. PS and thanks Dana for showing me this fascinating sea dragons video! If you have trouble picturing more dimensions, or dimensions enfolding around one another, think about the petals of a flower that grow and curl around. They are separate, yet they are part of the whole. 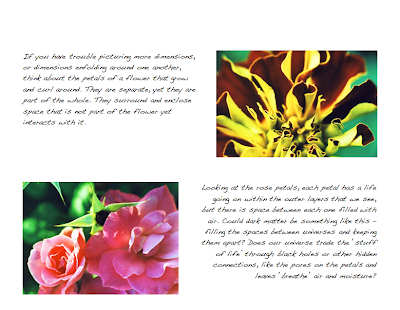 They surround and enclose space that is not part of the flower yet interacts with it. Looking at the rose petals, each petal has a life going on within the outer layers that we see, but there is space between each one filled with air. Could dark energy be something like this -- filling the spaces between universes and keeping them apart? Does our universe trade the "stuff of life" through black holes or other hidden connections, like the pores on the petals and leaves 'breathe' air and moisture? We've talked a lot about physicist Sean Carroll whose ideas about how the underlying symmetry state that our universe springs from is the same thing both "before" and "after" the existence of the universe. "Before" and "after" are in quotes because you're not really imagining this properly until you've visualized the place where all of these possible states exist simultaneously: the place where, as Einstein liked to say, the separation between past, present and future is an illusion, albeit a persistent one. Blogs talking about Sean Carroll and the timeless perspective that this way of visualizing the dimensions is based upon include Time in Either Direction, The Spacetime Tree, Scrambled Eggs, Unlikely Events and Timelessness, and What's Before and After?. The idea that "time" and "anti-time" are each just directions, in the same way that east and west or up and down are directions, and that you need to consider both opposing directions as a package in order to be talking about a spatial dimension is discussed in entries like Time is a Direction, Elvis and the Electrons, and Are Pictures More Important in Science?. 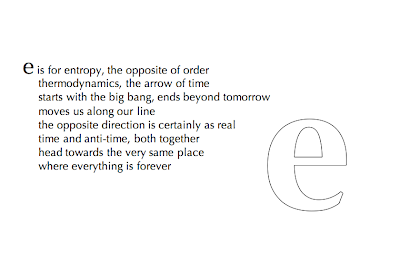 Likewise, this project insists that the "arrow of time" is an illusion created by the fact that we are constructed from chemical processes that obey the thermodynamic laws of entropy, and that time's reverse direction is just as valid within the laws of physics. The closing line of the above poem is, of course, a reference to Gevin Giorbran's book of the same name, and Gevin understood very well what it means to think about these structures as all ultimately existing simultaneously. We've discussed a number of approaches to timelessness in blog entries like You are Me and We are All Together, "t" Equals Zero, The Big Bang and the Big Pie, and The Invariant Set. our line of time is not so straight and narrow! 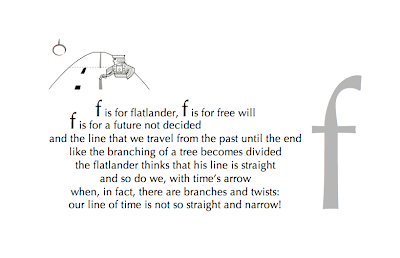 Understanding how time is really just a direction in the "next dimension up" is also key to all this: for our fictional flatlander, "time" would be a direction in the third spatial dimension, just as we 3D creatures experience "time" as a direction in the fourth spatial dimension. There has been much opportunity for confusion here, because physicists often count "time" as being a separate concept from the ten spatial dimensions: in Aren't There Really 11 Dimensions?, I argue that if physics says the first three dimensions are spatial, and also says that the fifth dimension and above are spatial (or "space-like" as some physicists prefer to say), then we need to understand our relationship to the fourth spatial dimension for this all to make sense. For more about all that, check out Hypercubes and Plato's Cave, What Would a Flatlander Really See?, What Would a Linelander Really See?, and What's Around the Corner?. Next in the book is another one of Marilyn's thought-provoking illustrations, we don't really get the impact in this tiny little representations in this blog, but in the book these images are great to meditate upon as we ponder all the different ways of organizing the information that becomes reality... the selection patterns that become our universe or any other. 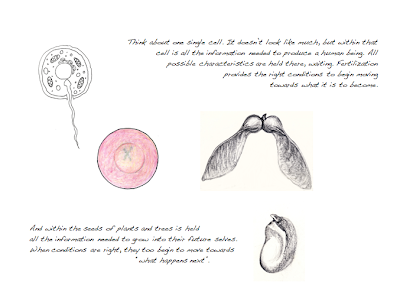 Think about one single human cell. It doesn't look like much, but within that cell is all the information needed to produce a human being. All possible characteristics are held there, waiting. 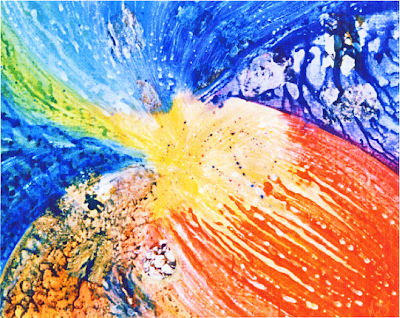 Fertilization provides the right conditions to begin moving towards what it is to become. And within the seeds of plants and trees is held all the information needed to grow into their future selves. When conditions are right, they too begin to move towards "what happens next". The idea that there is something mysterious and marvelous about life and the building blocks that create life, is a recurring theme within this project. In Beer and Miracles, I talked about scientist Raul Cano, who made the astonishing discovery of yeast cells that had been trapped dormant in amber for 45 million years. When Dr. Cano extracted the yeast and provided the proper growing conditions, the yeast immediately sprang back to life. If that isn't a powerful demonstration of how life is a process that is engaged with our reality through connections that extend beyond the "now" we are currently in, and into the possibilities of "what happens next" then I don't know what is. 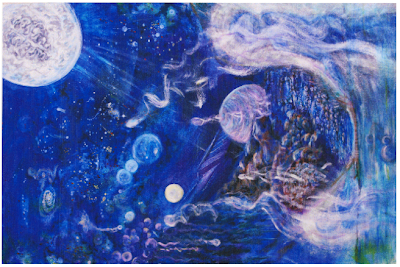 Other blog entries where we've talked about life, spacetime, and connections that exist outside of spacetime include Creativity and the Quantum Universe, Our Non-Local Universe, The Quantum Solution to Time's Arrow and The Biocentric Universe Part 2.
of the cosmos we're within. that travels on a line, and observes the quantum waves? Part of the difficulty in determining how big and how old the universe really is relates to the fact that we can't see beyond the cosmic microwave background, or the "surface of last scattering" as it's sometimes called (we talked about this recently in Seeing Time, Feeling Colors, Tasting Light). This scattering occurred about a half million years after the beginning of the universe, and it creates a relatively smooth sphere which we find ourselves to be right at the very center of. In entries like The Statistical Universe, An Expanding 4D Sphere, and Alien Mathematics, we've talked about the cosmological horizon, and how that horizon can be compared to being in the center of the ocean: even though we see an ocean horizon that is an equal distance away in each direction, we know that there is much more beyond that horizon. In The Holographic Universe we showed an animation conveying how just as it's the slight curvature of our earth's 3D sphere that creates our observed ocean horizon, it's the slight curvature of our universe's 4D spacetime that creates the illusion that we're right at the center of our spherical universe, and prevents us from seeing any further back in time than 13.7 billion years. So the idea that we're at the very center of the observable universe makes perfect sense from a cosmological viewpoint. Yet when we say the same thing from a philosophical viewpoint, critics dismiss it as new age "woo-woo" thinking. We've explored the relationship between consciousness and the universe each of us is observing in a number of blogs, including Where Are You?, The Shaman, You Have a Shape and a Trajectory, and Placebos and Nocebos. Where the ideas of consciousness and cosmology really start to blend together is when we add in quantum indeterminacy and the mysterious role observation plays in locking in one outcome or another. We've talked about some of the amazing scientific theories that stem from this in entries like Creativity and the Quantum Universe, The Biocentric Universe, The Biocentric Universe Part 2, and The Flexi-Laws of Physics. Are each of us creating our own version of the universe through our observation and the choices we make? You bet we are. four per cent of all that there should be! but harder to picture as we add on more"
This may seem laughable, but without the multiverse our finest theories predict that empty space should contain about 10123 times more energy than it actually does. This is known as the “cosmological constant” or “dark energy” problem. It has been called the “worst prediction in the history of science” and the “mother of all physics problems.” And it was the main reason why Polchinski and I, building on work of Steven Weinberg and others, began studying the multiverse of string theory. In Dark Gravity Across the Dimensions, I discussed a new scientific theory that appears to echo what I proposed four years ago in my first book: that science tells us gravity is the only force that exerts itself across the extra dimensions, the "pulling together" of dark matter and the "pulling apart" of dark energy are examples of gravitational attraction being exerted from additional dimensions in different ways. that locks in our universe"
In entries like The Statistical Universe, The Map and the Territory, The Long Undulating Snake, and Alien Mathematics, we've talked about the cosmologists who tell us that there are a great many other universes out there beyond our own, and each of those universes would have their own unique structures that make them completely different from our own, with basic physical laws that would make it impossible for life as we know it to function. 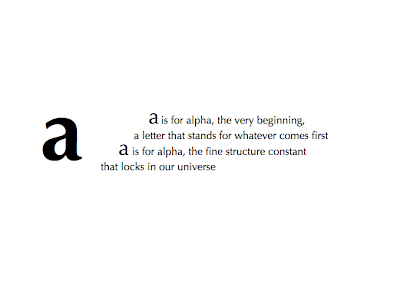 The wikipedia article on alpha, the fine structure constant, explains this idea further. 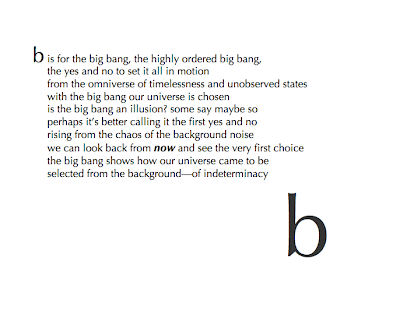 selected from the background—of indeterminacy"
The currently accepted version of the big bang is known as “inflationary cosmology”, in which it is proposed that the size of the universe increased by a factor greater than a million trillion trillion in less than a millionth of a trillionth of a trillionth of a second. Does this mind-boggling amount of sudden inflation not sound more like the flipping of a gigantic yes/no toggle switch? Thinking of the big bang not as a real event but rather as an observed side effect of the selection process that chose our universe from out of the multiverse landscape of all possible universes is an idea that is beginning to be supported by some mainstream scientists, and in particular the field of digital physics. I've discussed this in blog entries like God 2.0, The Big Bang is an Illusion, The Flexi-Laws of Physics, and What's South of the South Pole?. With O is for Omniverse, my aim is to distill the ideas we've been talking about with my project into something that appeals more to intuitive/right brain people. The above commentary is for the left brain/analytical thinkers who might be thinking that O is for Omniverse is a simple children's book, when it's much more than that. There is a lot of deep information encapsulated into the images and text of this book, something that even you left brain thinkers will enjoy once you start to delve into what's being discussed more deeply.